You survived Thanksgiving! But now you have a pile of turkey in your fridge. If you’re wondering what to do with all that poultry, don’t worry. It’s a versatile meat, and using it will help stretch your grocery budget. 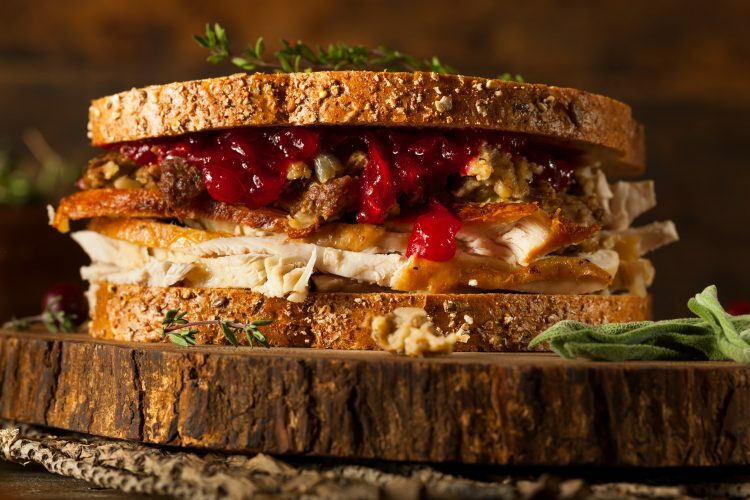 Here are five different dishes to make with leftover turkey. And remember, if you’re totally over eating turkey, you can always freeze the rest of it in a Ziploc bag to enjoy later. That way you don’t waste any. To make turkey stock, place the carcass in a large stock pot. You may need to break it into smaller pieces so it fits. Add your leftover drippings, a sliced onion, two chopped carrots, and two stalks of celery. Season with bay leaf, salt, and pepper. Bring the stock to a boil and then reduce the heat. Use a slotted spoon to skim any foam off the surface. Reduce the heat and let simmer for four hours. Use tongs to remove the large bones and chunks of vegetables. Use a strainer to strain your stock and store in jars in the fridge for up to a week. Put the oil in a soup pot, and once it heats sauté the carrots, onions, and celery until softened. Add your garlic and cook for another minute. Carefully pour in your turkey stock. Season with poultry seasoning, salt, and pepper. Bring to a boil and reduce heat until the vegetables are cooked. Add the egg noodles and cooked turkey. Cook until the turkey is hot. Combine the soup, water, and seasonings in a 10-inch skillet. Cook over medium heat until it boils. Stir in rice, turkey, and vegetables and reduce the heat. Cover the skillet and cook for five minutes. Pour the gravy into a medium skillet and bring to a boil. Add the turkey and reduce the heat. Cook until the turkey is hot and the gravy is bubbling, stirring occasionally. To serve, place two slices of bread on each plate. Spoon the turkey mixture over the bread. Pour ½ cup enchilada sauce into bottom of prepared pan. Spread. Reserve ½ cup enchilada sauce for topping. Combine the rest of the enchilada sauce with the turkey, ½ cup of cheese, and ¼ cup of green onion. Place the tortillas in a stack and warm in the microwave for 45 seconds. Take one enchilada and spoon the turkey mixture down the center. Roll up and place seam side down in pan. Top with reserved sauce and the rest of the cheese. Preheat oven to 350 degrees. Grease a 9X13-inch pan. Mix turkey and broccoli in prepared pan. In a bowl, combine soup, milk, and cheese. Pour over turkey mixture. Spread stuffing on top of casserole. Before buying ingredients for any of these meals, remember to check for coupons on iRazoo. You’ll save money and use up all your turkey!